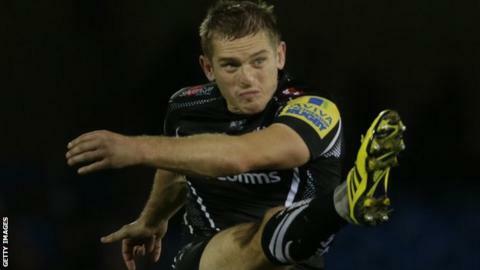 Gareth Steenson's haul of 19 points secured an impressive win for Exeter over Leicester in the Premiership. The Chiefs fly-half stretched for the only try in the opening stages, before adding two penalties to give the hosts a 13-3 lead at the break. Adam Thompstone had a try disallowed for the Tigers, who had only two Owen Williams penalties for their efforts. The win moves Exeter to second, two points off leaders Saracens, while Leicester drop to fourth. A superb defensive effort from Rob Baxter's side laid the foundations for victory as the Tigers struggled to break them down. After a bright opening, Exeter turned down the opportunity of three points from a penalty and kicked to touch, and their endeavour was rewarded when Steenson touched down from close range following some excellent driving mauls. Thompstone looked to have got Leicester back in the game with a stunning long-range effort, but James Short's leg prevented him from grounding the ball. It took until the 63rd minute for the next points in the second half when Williams knocked over his second penalty, while Steenson added his final two penalties in the closing stages as they closed the game out to get their first league win over the Tigers in four seasons. "For me the most pleasing thing is that we didn't buckle in the moments of pressure, that is typically where we have failed against Leicester in the past. "We have always been able to score some points but there have been moments in the games where they have seized momentum from us and rammed it home. "Gareth Steenson was fantastic and the scrum was too and I think the whole pack stood up really well and we dominated them in that area." "You have to give credit to Exeter as we were on the back foot for a lot of the game. "We struggled at set piece today and we couldn't get a foothold in the game and that cost us. "It's round four, there's a long way to go and we've got a lot to get better at." Exeter: Dollman; Nowell, Slade, Whitten, Short; Steenson (capt), Chudley; Hepburn, Cowan-Dickie, Francis, Lees, Welch, Ewers, Salvi, Armand. Replacements: Yeandle, Rimmer, Low, Atkins, Waldrom, Lewis, Hill, Jess. Leicester: Veainu; Thompstone, Smith, Bai, Goneva; Williams, Ben Youngs; Balmain, Tom Youngs, Cole, Barrow, de Chaves, Croft, McCaffrey, Crane. Replacements: Thacker, Brugnara, Pasquali, Fitzgerald, Pearce, Kitto, Betham, Tait.